Jade is full of energy and ready to share her life with a family that will commit to her, unconditionally. Because Jade is so active, Jade looks forward to a family that enjoys sports, playing board games, card games, and taking vacations. Jade is a bit more modest, as she only describes herself as smart. When asked what her favorite restaurant is TACO BELL without hesitation. Jade is in the fifth grade for the school year 2013/2014 and also does well academically. She maintained that all her subjects are favorites. 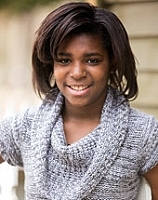 Jade expresses excitement when it comes to moving forward in her life with a new Forever Family. Jade would like her forever family to have other children, but had no preference regarding her placement order in the family. Jade enjoys living in Louisiana so much that she has made a special request for us to only entertain inquiries from families within the state.